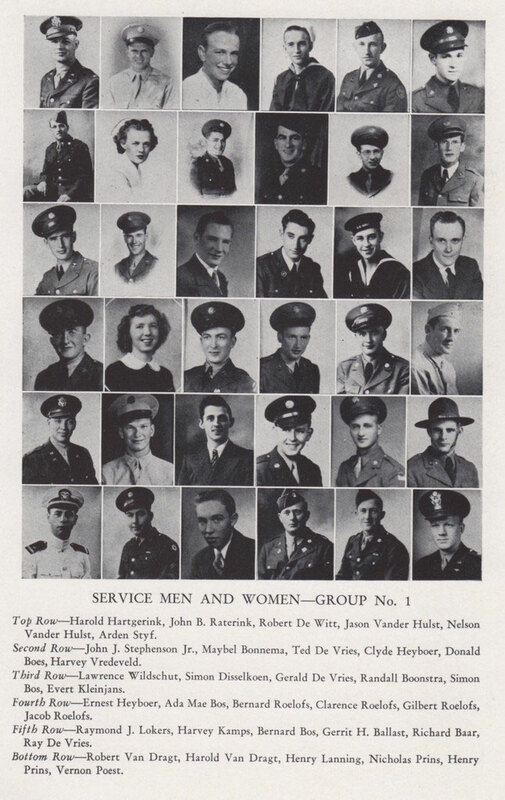 This Honor Roll book shows the World War II service men and women and their families. 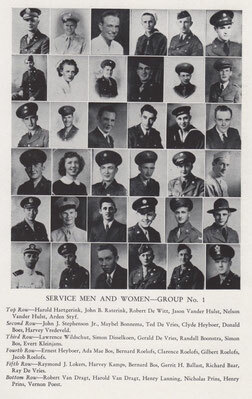 At the time of the first printing, June 1, 1944, this Honor Roll Book contained the names of 285 service men and women. 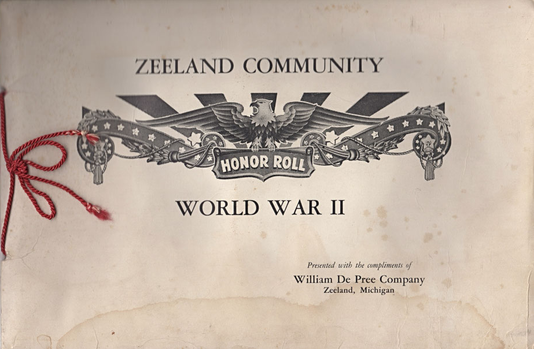 The Zeeland Honor Roll listed below are located in the Zeeland Museum's research room. 1 Fifth Ballast Gerrit H.
4 Bottom Baron Melvin E.
8 Bottom Baron George E.
6 Bottom Baron George E.
7 Bottom Baron Philip H.
12 Third Battjes Gerald E.
10 Bottom Bonnema Benjamin C.
2 Bottom Boonstra Earl R.
11 Third Bos Raymond W.
4 Top Bouman Donald G.
7 Second Bouman Gordon W.
12 Bottom Bowman Theodore E.
13 Second Bowman Alfred H.
12 Third Bremer Marvin P.
11 Third Brouwer Howard W.
8 Third Claver Randall W.
9 Second Danielson Carl N.
8 Third Danielson Paul L.
8 Top Danielson Earl N.
7 Second De Jonge Carl J. 10 Second De Pree Hugh D.
10 Third De Pree Max O. 6 Bottom De Vries James J. 12 Second De Vries Herman C.
10 Third De Witt Albert E.
3 Top De Witt Jr. Ben J. 7 Top De Wys Bernard A. 2 Third Dekker Donald E.
7 Bottom Dekker Randall M.
4 Bottom Derks Donald M.
10 Third Deur Robert J. 2 Second Donia Ward J. 11 Bottom Elbing Raymond H.
3 Second Elhart Baxter J. 12 Third Essink Jerome M.
4 Top Forsten John H.
5 Top Gebben Eugene G.
2 Third Gitchel James W.
3 Third Goorman Gerrit J. 7 Second Hall Willis E.
5 Fourth Hamer John N.
10 Second Holcomb Arnold J. 4 Top Holleman Gordon E.
4 Bottom Huyser John J. 12 Top Johnson Henry J. 13 Third Kamer Harry D.
6 Top Kamps John H.
4 Top Koning Simon J. 10 Bottom Kornoelje Gerrit J. 10 Third Kotts John J. 10 Third Krol Preston J. 13 Second Kuipers George R.
10 Bottom Lanning Clifford J. 1 Fifth Lokers Raymond J. 12 Second Lookerse Gerry P.
11 Third Meeuwsen Clarence B. 10 Second Meidema John A. 3 Second Moeke George B. 4 Center Moerdyk Earl R.
5 Third Mulder J. W.
9 Bottom Nies Leon H.
12 Third Post John E .
1 Top Raterink John B. 4 Center Roelofs Milton B. 2 Second Roelofs Nathan J. 10 Top Schilstra Wallace G.
8 Third Schripsema Kenneth E.
11 Top Schut Warren H.
8 Second Shoemaker C. J. 13 Second Slagh Jowan G.
12 Bottom Slagh Junior J. 11 Third Smallegan Howard E.
10 Top Smith James J. 6 Bottom Staal Harold J. 10 Top Steenwyke Ben L.
1 Second Stephenson Jr. John J. 7 Second Sterken Henry L.
12 Third Taylor Martin H.
8 Second Van Dorp Richard J. 4 Center Van Dyke Harold E.
11 Bottom Van Flieren M.
8 Second Van Zoeren Allen J. 3 Bottom Vanden Heuvel Donald C.
10 Top Vander Hulst Ernest F.
12 Third Vander Kolk Anno M.
10 Third Vander Kolk Levi H.
9 Bottom Vander Kooi Menno D.
2 Third Velderman Alvin G.
7 Top Velderman Mrs. P.
7 Top Velderman John H.
3 Bottom Veldhuis Allen C.
13 Top Verhage Theodore M.
12 Second Vos Alfred J. 5 Top Vredeveld James H.
3 Top Walcott Henry R.
3 Third Waldo Hendrik C.
4 Top Walters Jerome J. 10 Third Wildschut Jack L.
10 Third Wildschut Lawrence J. 11 Bottom Wilson James W.
11 Bottom Wyngarden Donald M.
11 Third Wyngarden Milton D.
12 Third Zoet Charles J. 12 Bottom Zoet Junior A.